Our great-great-grandfather Charles Watchorn was born March 8, 1822 in Kilkenny County, Ireland and came to Canada in 1831 with his parents. He was nine years old when they arrived in Toronto and they settled in Montague Township, Lanark County, ON. There he must have met and married Annie Stone, born 1826. Ellen………………….1849…………..Listed in 1851 Lanark County census ?? The first five children were born in Montague Township, Lanark Co., ON; the family moved to Wellington Co. by 1855 and the last three children were born there. Annie died there in 1862. 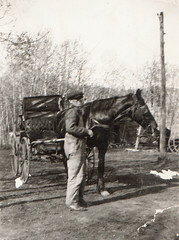 In 1870 Charles, with his children, his brothers and sisters and widowed mother moved to Bruce county and founded the settlement at Purple Valley. They were twenty in the family when they came to Bruce Co. The Watchorns were Conservatives and staunch Orangemen. 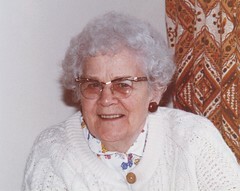 Alice married William Turner and became our grandmother’s mother. Grandmother Alice Watchhorn (Turner)(1855 – ?) is on the far right. Henrietta (1852-1907) is probably not in this photo. 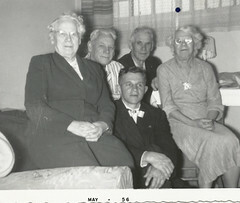 Emily (1862 -1945) was the youngest daughter and she is probably the lady on the left front. The youngest son was Thomas (1860-1917) and he is probably the man seated on the far right. If this protocol was followed, then the father Charles is likely the man directly behind Annie or Ann. He has light colored hair which may be gray or blond. The oldest daughter Mary (1844-1932) would be the back left lady. The oldest son William (1845-1925) would be next to his father at the back right. John (1853-1935) is then the man on the left. We welcome your comments and your suggestions about this identification. Note 1.:Information on Francis Waugh, husband of Anne Waugh (Watchhorn) family can be found at: http://www.waugh.ca/history/ Anne Watchorn, born April 25,1848 in Lanark County, ON, married Francis Waugh (1849-1927). The two quite possibly met in Wellington County where Anne’s family resided until 1870. 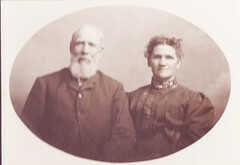 Anne’s family moved to the Bruce Peninsula (Wiarton area) in 1870; Anne & Francis were married Dec 11, 1872. Note 2: Charles’ first wife Annie died in Wellington County, and the Ann (listed as mother of the bride Emily) was a Tyndall, not Stone, so he must have remarried. It is unknown if the mother in this picture is Annie or Ann.